Balancing your pool chemistry is among the most important steps of pool maintenance. 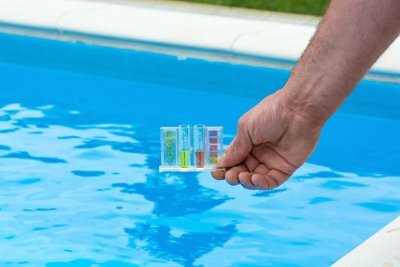 After your swimming pool installation has been completed, it will be up to you to make sure that your swimming pool water is not too acidic or alkaline. The process of balancing your pool water is known as maintaining a neutral pH. A pool contractor in Salt Lake City can provide you with all of the swimming pool maintenance tips you need to ensure that your chlorine or salt water pool has a neutral pH. Read on for a look at some of the basics about pH and your swimming pool. There are several reasons why it is very important to keep the pH of your pool water balanced at all times . Since the chemicals in your pool are responsible for clearing away bacteria, algae, and other unwanted particles, balancing your pool water is an important step of keeping your pool water clear. In the event that the pH of your pool water gets too low or high, your swimming pool may become an unhealthy environment for swimming and recreation. When the pH of your pool water becomes too high, your pool may begin to exhibit the signs and symptoms of acidity. For example, you may notice calcium deposits on the surface of your pool, and you may also find that your pool water is cloudy or murky. Additionally, you may experience burning or redness when you enter your pool. Certain pool chemicals can be added to your water to drop the pH instantly. In the event that the pH of your pool water gets too low, your pool may begin to experience the symptoms that are associated with alkalinity. You may notice that the grout around your pool is corroding, or that the metallic elements around your pool are rusting. When your pH is low, your chlorine tablets may also dissipate very quickly. To remedy low pH in a pool, it is suggested that you add a base to your chemicals. When you are planning a pool installation near Salt Lake City, you may want to include an outdoor fireplace in your design. An outdoor fireplace will provide you with great opportunities to kick back and relax around your pool installation or hot tub installation. To start a fire in your outdoor fireplace, there are a few tips that you can keep in mind. By starting your fire with newspaper, you can help larger logs or pieces of wood ignite more quickly. Before you start a fire in your outdoor fireplace, you should also make sure that any flammable objects or materials are safely away from the area. For a closer look at more tips on how to start a fire in your outdoor fireplace, be sure to watch this video clip. What Swimming Pool Style Matches Your Outdoor Space? When you are planning a swimming pool installation near Salt Lake City , you will have many factors to consider. From the shape of your pool to the materials that you use for your pool deck, it is essential to make sure that you carefully consider each element that goes into your pool installation. Swimming pool builders in your local area will be able to help you construct the swimming pool of your dreams. By matching your swimming pool or hot tub installation to the shape and design of your yard, you will create a pool area that matches perfectly with your property. Here is a look at how to select the perfect swimming pool for your outdoor space. The rectangle is a classic shape for swimming pool design . When you choose to install a rectangular pool on your property, your new pool will provide the perfect place for swimming laps and playing games in your pool. Since rectangular pools are more formal in their design, these types of pools will match perfectly with formally landscaped outdoor spaces. If you are seeking a unique swimming pool style for your property, you may want to consider choosing an oval pool. Unlike rectangular pools, which have perfectly squared edges, oval pools are soft and rounded in their designs. An oval pool will be a good fit in an outdoor space that is contemporary or more informal in design. In addition, your oval pool will provide you with ample perimeter space for setting up lounge chairs, games, and other items. 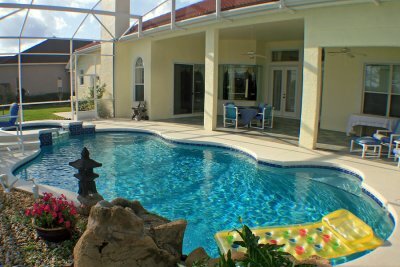 An L-shaped pool is a popular choice for many homeowners. This type of pool will allow you to create separate spaces for diving, lounging, and swimming laps. When you are considering installing a pool around the corner of your house, an L-shaped pool may be the perfect fit for your property. With its contoured shape, an L-shaped pool can be customized to fit in with many different landscaping arrangements. Whether you are constructing a new home or are seeking to upgrade your current landscaping, you may want to consider incorporating a water feature in your design. A pool contractor in Salt Lake City will be able to work with you to design the perfect water feature for your yard . When you are choosing a water feature, you should consider what type of function you would like your water feature to perform. For example a pool installation or hot tub installation will provide you and your family members with a relaxing destination in your backyard. To highlight a certain landscaping area, you may want to consider installing an eye-catching water feature, such as a fountain or a waterfall. Other features, such as outdoor ponds, can add tranquility and serenity to any outdoor space. By enlisting the help of a pool installation professional, you will be able to create the brand new water feature of your dreams.